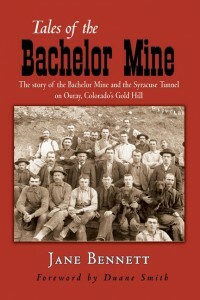 Book Review - Bachelor Mine - San Juan Publishing Group, Inc.
Softcover, 125 pages. At local bookstores or from San Juan Publishing. “Tales of the Bachelor Mine.” Purchase book. IT IS THE STORY OF A PLACE, but more than that, it is the story of a people—the miners who braved the darkness and risked death each day, working sometimes in cracks just wide enough to move their elbows. For author Jane Bennett, it was a tale that had to be told—despite the demands of work and home, and the occasional need for a good night’s sleep. After seven years of interviews, research, and sheer stamina, Bennett completed her project, an accounting of the mine that she grew to love while working in Ouray’s tourism industry and as a summer tour guide at the mine itself. The book includes a foreword by famed Western Colorado Historian Duane Smith. While becoming an author has not changed her life in any dramatic fashion, the book is an accomplishment in which Bennett takes pride. “I was able to speak with several of our old timers, people like John Crim, Al Fedel, and Harry and Nick Peck,” she said. “Some of them have since died—so I am really glad I did this. And it is so very, very gratifying when people tell me that they enjoy it. One of my favorite authors is (historian) Barbara Tuchman—I want to write like her! So I like it that people tell me my book is engaging. During the years of preparation and work, Bennett found herself immersed in what almost amounted to a second community—the Ouray of times past, a vivid world in which even four-footed citizens acquired personalities larger than life. Other personalities that Bennett came to know were Bachelor mine owners George Hurlburt, Charley Armstrong, and J. Frank Sanders. In an industry where job satisfaction depended greatly on the mine at which one worked, the Bachelor Mine, opened in the 1880’s, was unusual, she noted. Ring tail cats were also prized by miners, not only for their ability to catch pests such as mice, but for their sensitivity to noxious fumes, which provided advance warning to men in the mines. The Bachelor mine’s importance to the community of Ouray grew, as it acquired a reputation for being safe and well run, and because it was close to town. The mine remained open throughout the hard years of the Great Depression, making it possible for miners and their families to ride out the rough times. Although the Bachelor mine today is known more for the tours that have become popular with locals and visitors alike, active mining could resume with a “mere 30-day startup period,” according to Bennett, who notes that some of the Bachelor Mine’s appeal lies in its exciting and mysterious appearance. Much of the mine itself remains shrouded in mystery despite the tours that take visitors 3,350 feet down into the heart of the Earth. “So extensive are its workings that no one really knows for sure how many miles of them there are,” Bennett wrote in her book. Like many of the miners of whom she writes, Bennett will most likely not strike it rich with her book. And yet, she is pleased to share the story of Ouray’s Bachelor Mine, the minerals extracted from it, and the lives of the early miners with readers of all ages. And besides, wealth can take forms other than silver and gold. Formerly a resident of Ouray County, Colorado, Jane Bennet Wright now lives in Cambra, Australia. She is a professional storyteller and musician as well as an author. Her repitoire includes Cowboys, Rodeo & Ranch Life, Indians & Native American History, Mining Legend & Lore, and Romantic Tales & Ghost Stores. She is available to speak with groups and organizations of all kinds. To schedule a storytelling event, or for more information, please contact our editor.